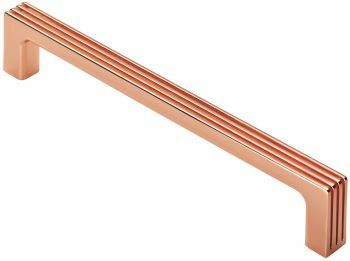 Copper finish Darini square section cupboard handle with 3 grooves running along its slender length extending around the mitered ends providing a nice finishing touch. Rear bolt through fixing. The design has a hint of Art Deco and would look good in either a modern or traditional setting. 160mm fixing centres, width 12mm, projection 30mm.